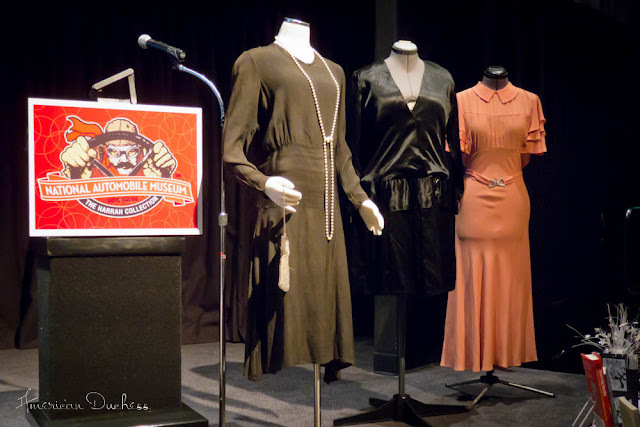 Last night Lady Carolyn and I co-presented "The Bee's Knees and the Cat's Meow: Fashionistas 1920s Style," a general survey of [mostly] women's clothing and fashion trends through the Roaring '20s. Carolyn and I both brought all kinds of garments to show, extant and re-creations, as well as props like hats, a tennis racket, a ukelele, hair clips, shoes, etc. 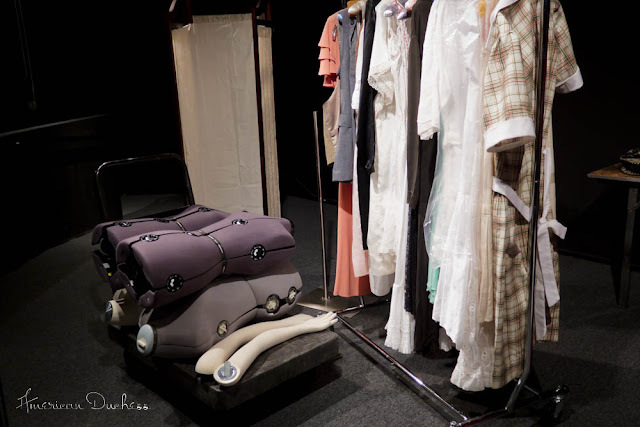 We dressed a whole pile's worth of dress forms to display on stage, and also held up items during the presentation. It went really well! 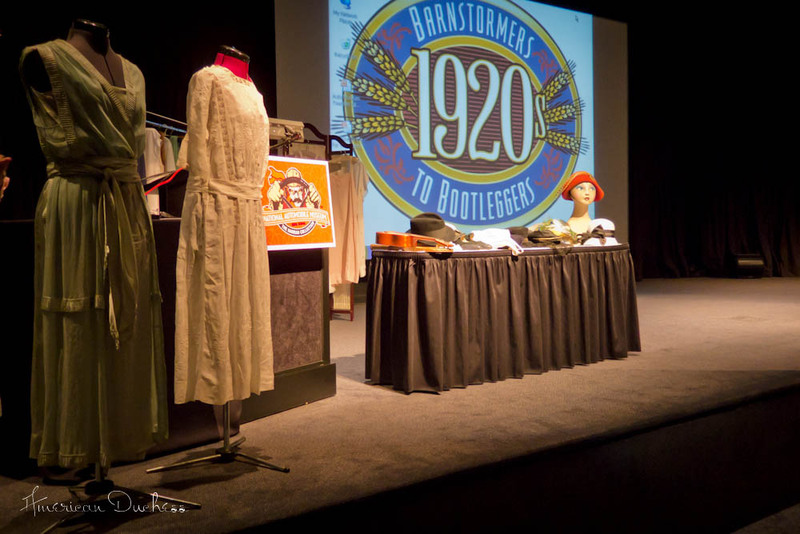 The talk was part of a five day symposium called "Barnstormers to Bootleggers," hosted by The National Automobile Museum here in Reno. Participants attended lectures on all aspects of the 1920s - jazz, prohibition, fashion (that's us), and of course the cars of the time, and how they fit into this unique period in history. I didn't get many photos, but here are a few of our stage, and also a short clip of a bit of our presentation. Items to pull out and show in the background, and a table full of accessories up front. 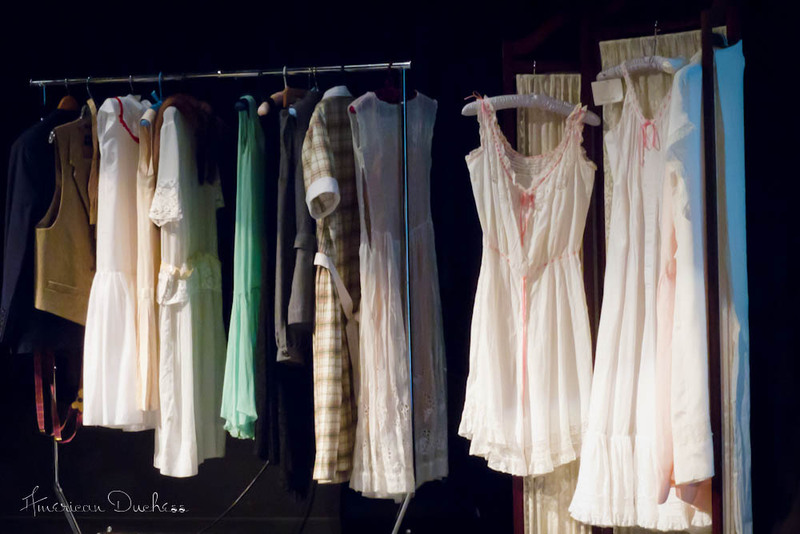 Underwear, and several dresses to pull out and who to the audience. We showed a clip from Thoroughly Modern Millie, that I posted here a little while ago, and I embarrassed myself, lol. Totally adorable and really cool! Those are some mighty fancy rags. Thanks! 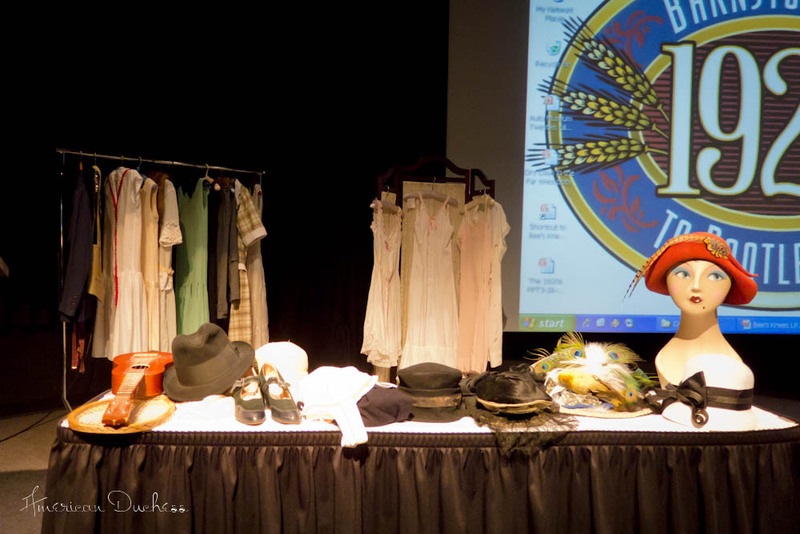 The majority were Carolyn's - she has an amazing collection of original garments, some of them with incredible stories. Gorgeous clip! So nice to see you in motion and not just in a still. Andit looks like you gave them a great lecture too. Love the walk. I guess some girls did alter their walk to be "cool". We aren't much better now. The boys with the goofy pants need to walk with their legs apart and hands in the pockets to keep their pants up. As a middle aged woman with a rehab background all I can see is future back and knee problems. that's a really good point - some of those boys look so silly, lol.